The Three Central Makati delivers luxury, comfort, and convenience to residents at the heart of Makati City. The 50-storey residential condominium towers by Megaworld redefine living in the financial district inasmuch as it reshapes the city skyline in sublime light blue glass and concrete. The fully fitted and furnished units give residents an exclusive style and culture to compliment the opulence of making it to the top in the financial district. The development answers the needs of metropolitan residents by placing their needs in front of their doorstep. An integrated project, the Three Central Makati offers, not only the home where the life is lived, but also shops, restaurants, cafes, boutiques, cinemas and other necessities of modern living in a luxurious mall that answers the tastes of the cultured resident. It not only answers the wants, but the needs as well with the inclusion of a supermarket where you can buy fresh produce and other necessities that make the metropolitan lifestyle possible, without the resident leaving the building. The Three Central Makati surely delivers on its promise of luxury, comfort, and convenience. Moreover with the price range ranging from P6.77M to P23.34M, you can have these luxuries as well as a prime investment in the heart of Makati’s Central Business District. Our flexible payment schemes adjust to your needs with Cash in 30 Days option offering a discount of 18%. Our 10-20-5-5-60 payment scheme offers 8% less on the down payment similar to our 20-15-5-5-55 payment scheme. Our 30-15-55 scheme on the other hand offers 12.5% less on down payment giving you the choice on what payment scheme to take at your convenience. The Three Central also delivers to the residents a complete package of home, covering living essentials such as an elegant sofa set with center table, a 21-inch LCD TV, bed frames with mattress, and dining table set giving character to your unit whose only missing part is you. The inclusion of necessities such as air conditioning units, microwave oven with cook top and range, washing machine and dryer, and refrigerator from well trusted brands ensures that you will spend your days in comfort in the Three Central Makati from day one. These fully furnished condominium units await you to complete them. 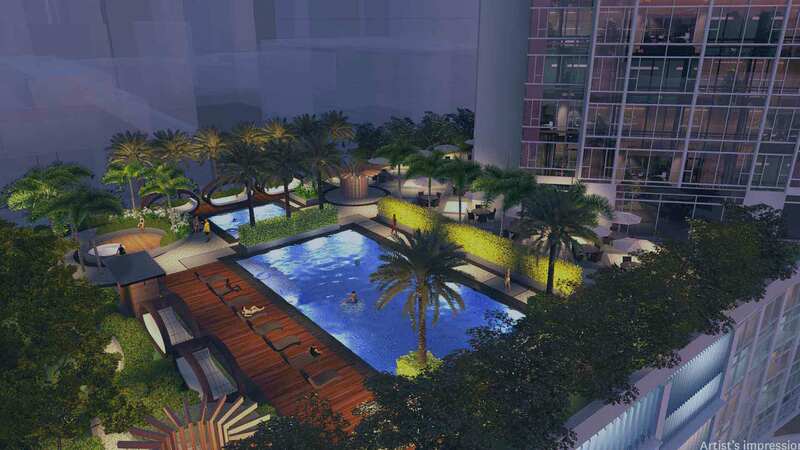 These spacious units will be your sanctuary offering comforts, convenience, and luxury unlike any other condos in Makati. Moreover the Three Central takes convenience further. Aside from its convenient location close to educational institutions, hospitals, business establishments, corporate headquarters, embassies and recreational areas, it has a lavish mall right to its doorstep. Enjoy your time indulging through the various boutiques, retail shops, cinemas, restaurants, cafes, and other modern conveniences without moving your GPS dot. The supermarket below your unit essentially brings the produce to your basket as your needs are already provided inside the establishments in the building. Not only are these conveniences right on your doorstep, Three Central provides you every opportunity to unwind be it a dip in the pool, or a chill night at the lanai at the roof deck. It is also child friendly as it provides spaces for parents and their children to bond such as the playground, as well as it considers the needs of a modern family with its day care facility giving parents the leeway to balance the household and work life efficiently and stress free. Units in the Three Central can furthermore return your investment though a steady monthly income should you opt to rent out your unit to people who want a home rather than an expensive hotel as they conduct their business in Makati. The Megaworld’s team of property management experts can handle your finances and your unit for you while you sit and relax at the comfort of your home. This is especially lucrative as expats, young professionals, vacationing families, honeymooners, students, and other interested individuals would want to seek a comfortable and convenient enclave within the city as they go around their business in Makati or Metro Manila. Makati itself is one of the leading financial centers in the not only in the Philippines but in the whole region of Southeast Asia as well. Being the center of financial activity, Makati is bound to grow hosting the economic movers of the country and the region. An investment in the Three Central Makati is timely as there seems to be no stop to the growth of Makati, and that the value seems to go only one way, and that is up. The Three Central can be the place where you further your career with opportunities left and right waiting for the individual with the right business acumen to harness them, as it is also a place to nourish a family as the environment is conducive for growth. The diverse environment brings about diverse opportunities in the Three Central Makati. Three Central offers three standard unit sorts which can be tailor-fitted to your lifestyle. All units are furnished with air conditioning units, a 21 inch LCD TV, refrigerator, microwave oven cook top and range hood, and washing machine and dryer by reputable and trusted brands. A sofa and center table, dining table set, as well as bed frames with mattress are provided keeping you comfortable in your new home. A water heater for the Master’s bedroom toilet and bath is also included in the units. The typical residential features include an entrance panel door with viewer, kitchen with modular under counter and overhead cabinets, individual electricity and water meter, individual mail boxes with keys, and individual Condominium Certificate of Title. There are also provisions for telephone and CATV lines, as well as hot and cold water lines that can be arranged should you fancy including them in your new home. The units are built with a modern design balancing functionality and style, keeping everything streamlined to the needs of its residents. Warm lighting adds to the homey ambiance of the units, highlighting wooden textures that are accentuated against white marble block countertops. Its smart placement of mirrors adds to its spacious feel making you comfortable as you move around your home. Furnished with appliances from known and trusted brands, you need not worry about the quality of the appliances you are using. The measured storage rooms, as well as the strategic placement of shelves makes for smart storage where you can maximize the use of space while at the same time remember where everything is. The Exclusive Studio Unit with a floor area of 41.1 square meters includes a sleeping area and storage room. It likewise includes a kitchen, toilet, and mechanical ventilation. It also offers a roomy living region and can come with split-sort aerating and cooling unit to be included on the takers’ request. The One Bedroom unit which measures 46.7 square meters includes a bedroom as well as secluded storage room for smart storage. It also has a kitchen and toilets with mechanical ventilation, as well as channeling of split-sort aerating and cooling unit should the resident decide its inclusion. The Two Bedroom with Balcony units with a floor area of 80 square meters has a bedroom with particular storage room and latrine and cluster. It also has a living range featuring an overhang which makes the units roomier. It also includes a kitchen and toilet, as well as a Utility/Maid’s stay. It comes with mechanical ventilation but can also come with split-sort aerating and cooling unit should the resident chose include it. Megaworld Three Central Makati in Makati City, Philippines is a premier Condo project available for sale. If you're looking to rent or purchase Three Central Makati, then check here first. We have full details of Three Central Makati updated regularly as well as everything you need to know about the availing and booking process, broken down into stages that includes selecting a unit, choosing a payment plan and buying your dream home at the right price. For price list, free site tripping or showroom visit, personalized service, model house, unit plans, floor plans, payment terms, CHAT LIVE with an agent 24x7. We are Remax Perfect Homes. Always only buy from PRC licensed Real Estate Brokers and Agents. Why invest in a condo somewhere else far away from your work? Or a condo unit that is lacking the basic essentials of a space you call home? At the Three Central Salcedo Village Makati, it is not only close to where you work, your unit also comes complete with branded appliances that include air conditioning units (not only one, though), elegant sofa set with center table, 21-inch LCD TV, bed frames with mattresses, dining table set, washing machine with dryer, refrigerator, microwave oven with cook top and range, kitchen cabinetry, water heater for Master’s bedroom T&B, and a lot more appliances of well-known brands. These, together with a spacious unit will be your lovable sanctuary largely different from other condos in Makati. Imagine a cozy living environment within Makati’s central business and financial districts, with all its glory and convenience. And an elegant residential suite that comes complete with all of your needed furnishings, very affordable, and brings you closer to educational institutions and workplaces. What more should you ask for? More convenience, actually. At the Three Central Salcedo Village, you are treated to a lavish mall right at your doorstep. There is a supermarket below your unit, with restaurants, cafes, boutiques, retail shops, cinemas, and other convenience modern life has to offer. A clever choice, indeed! If you would want to have a steady monthly income more sustainable than investing on the stock market, purchase one unit at the Three Central Salcedo Village Makati City and earn a lucrative income. How? You can rent out your unit to those who want a cool place to stay while they are in Makati, other than an expensive hotel. Like expats, young professionals, wealthy students, vacationing families, honeymooners, and other interested individuals who seek extraordinary enclave within the city while they conduct business within the metro. The Megaworld’s team of property management experts will handle your finances and unit, and all you have to do is sit and relax in the comfort of your home. Known as one of the leading financial centers in the Philippines and the whole of Southeast Asia, Makati City is bound to become busier than ever, it is currently hosting more of the world’s financial masters and in the near future, the city it seems has no sign of slowing down. Investing in the Three Central Salcedo Village Makati is not only timely but also a great place to nourish growing families and those individuals who want to further their careers in an environment where diverse opportunities abound.